Hot on the heels of sensor reviews for the Nikon Z6, Nikon Z7 and Canon EOS R cameras, DxOMark has a review of one of Panasonic's first full-frame mirrorless cameras, the 24-megapixel Panasonic S1. 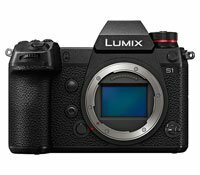 To briefly recap, the Panasonic S1 (and 47-megapixel S1R) are the first two cameras in Panasonic's new full-frame mirrorless camera system, which incorporates the existing Leica L-mount. The S1 and S1R are primarily differentiated by their sensors, but the two cameras, which share a body, also offer slightly different performance, particularly with respect to video shooting, with the S1 offering more bang for the buck in that regard. As is often the case these days, when evaluating the S1 on a pure image sensor basis, you must split hairs to separate it from its peers. Per DxOMark's rigorous testing, the S1's 24-megapixel full-frame sensor offers 14.5 Evs of dynamic range and a portrait color depth of 25.2 bits. This puts it in company with the Sony A7 III and Nikon Z6 and a decent bit ahead of the Canon EOS R and Leica SL (Typ 601). In terms of overall score, with a score of 95, the S1 finds itself 12th overall in DxOMark's rankings. Image credit: DxOMark. To view image larger, click here. With so many great full-frame mirrorless cameras available now in the 24-30 megapixel range, it doesn't appear that the image sensors themselves will be the primary point of differentiation. Rather, it will come down to the body design, available lenses, autofocus performance, continuous shooting performance and video features for most users. With respect to this, DxOMark says, "When you combine a high-performing sensor with a proven AF system, built-in stabilization, 9 fps continuous shooting, and a relatively new lens mount backed by influential lens makers, you have a highly capable camera and the beginnings of a promising system that can pose a serious challenge to the top three camera makers." If you'd like to read more about the Panasonic S1, including hands-on coverage, head to our ever-expanding Panasonic S1 Review. For more great sensor analysis, head to DxOMark.